When I was a child, I always wanted to sing in a band, preferably an all-girl band, called “The Beach Girls”. As a young adult, I did get my wish of singing in a band. It was fun, fun, fun, sometimes, but there was also an awful lot of WAITING and sometimes it was….boring. No one joins a band to be bored! After five years of songwriting, recording, touring the country in dodgy transits, 80s crimes against hair and fashion, etc, with not a great deal of success, we called it a day. I then became a futon seller, window dresser, and teacher of English as a second language, all the while continuing to perform in bands, most notably Bait, the Lilac Time’s big brother. For the last 20 years I have been happily settled in Frome. Although initially known as motheroftwins, I am now better known as singinglady. 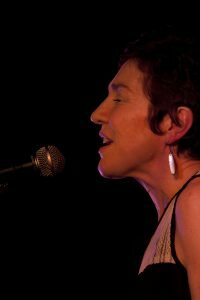 I began teaching singing and musicianship in schools, based on the Kodaly technique. I love a bit of doh-re-mi, (and those are all valid scrabble words too). I gradually started teaching adult groups. Currently I run three choirs: Jackdaws Songbirds in Frome, Shreen Harmony in Mere, and Sounding It Out in Trowbridge. I also lead two Singing For The Brain groups, in Bradford-on-Avon and Westbury, and sing with children in Sutton Veny primary school. I love discovering songs and writing arrangements to suit each group, and then hearing how the singers bring the song to life. I know I should really have a hobby away from music, but I am a useless gardener. In my spare time, I’m a singer and songwriter with local band Three Corners, and I also sing with the Terry Hill big band. I am forever indebted to Mannie Burn, Maureen Lehane-Wishart, Rasullah Clarke, and Fay Caley for showing me the way. Now that I am teaching, I am never bored. Ever.